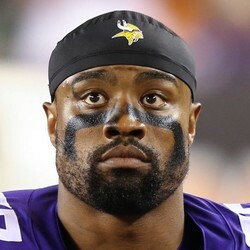 The Vikings and defensive end Everson Griffen agreed on a revised contract Thursday afternoon that will keep the 31-year-old in Minnesota for at least one more season. While the official numbers aren’t yet known, it is believed that Griffen will make around $8 million in 2019. Griffen was likely to be released had he not been open to a revised contract. The two sides were able to strike a deal before Griffen’s previous $10.9 million in salary became guaranteed at 3 p.m. Central time Thursday. Griffen missed five games in 2018 due to mental health issues. He was hospitalized after an incident that required police intervention but was able to return to the team after several weeks. Griffen finished the season with 5.5 sacks in 11 games. Everson Griffen ended the season on a strong note racking up six total tackles during Sunday's 24-10 loss to the Bears. After missing five games this season dealing with personal matters, Griffen was able to end the season with 5.5 sacks and 33 total tackles. He seems to be back on track and IDP owners can draft him as a DL1 in most formats. Everson Griffen racked up two tackles and a sack during Sunday's 27-9 win over the Lions. Since returning in Week 8, Griffen has accounted for 4.5 sacks for the Vikings. It is safe to assume that he is still a great investment in IDP dynasty formats and is worth rostering in most leagues. Everson Griffen finished Sunday's win over the Dolphins with three total tackles and a sack. Griffen now has 4.5 sacks and 25 tackles this season. If this is a sign that Griffen is getting back to his old self, he is worth a look in most IDP leagues. In most cases, Griffen could be kept on waivers. Everson Griffen finished Sunday's win over the Lions with four total tackles and 1.5 sacks. Since returning to the field last week, Griffen has added five total tackles and 1.5 sacks. The Vikings are on a Bye in Week 10, but Griffen should be able to keep this momentum rolling into the Week 11 game against the Bears. See if Griffen is available on waivers, this might be the last time owners can still add him to rosters on the cheap.